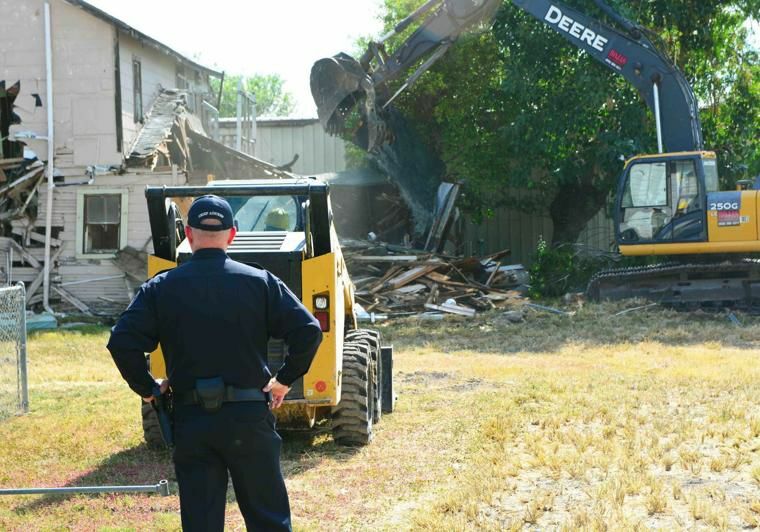 Police Chief Jeffry Adickes looks on as a National Guard demolition team crushes one of his department's biggest residential problems. This residence at 513 W. Monroe has generated hundreds of calls and complaints from neighbors. The Guard's "Operation Crackdown" will remove 23 abandoned and neglected homes in their tour of duty this year. HARLINGEN — As the excavator crashed through the roof of the home, it spelled doom for one of the city’s biggest problem residences. “Operation Crackdown,” the Texas National Guard’s effort to improve communities by subtraction of abandoned and dilapidated housing, is here to remove 23 of the neglected homes. Today, it was 513 West Monroe’s turn. For Adickes and his officers, the removal of the home on West Monroe has special significance and its destruction probably calls for some kind of department celebration. This year marks the seventh year the National Guard has come to the city to help remove unwanted properties. It is part of the guard’s Joint Counterdrug Taskforce and uses soldiers in demolition units to remove dangerous structures at no cost to communities. The houses scheduled for demolition this year, once operations finish, will total 205 such structures removed in Harlingen alone since the program began.